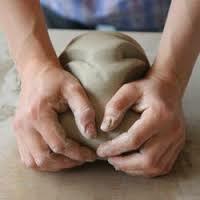 Clay can get shape by molding: roling, strings, (pots) throwing and casting. For injection moulding, forms are made ​​in plaster in which the liquid clay is poured. Plaster draws moisture from the clay. The soft remaining inside is poured back after a few minutes. The smooth- kneading of the (purified) clay is the most important operation. For firing all air must be wedged out. Remaining air bubbles expand in the kiln and make the piece explode. And this can also damage other parts. You can make even hoses, rolls of clay, and put them spirally on each other to adhere to a jar. Contact surfaces you make a little extra wet. You press them well, so that no air bubbles are catched between. You can smooth the ribs more or less equal by ironing or washing. You can use a rolling pin on a table between two equally thick slats and roll uniform plates. Which you can then cut into shapes and weld pieces together as above. Purple Moor Grass (Molinia caerulea) is a grass that grows best between heath and has no knot in the culm (only one, very close to the ground). That made the blade suitable for clay (or clay loam) to turn around so as to make the stem of a pipe. It was also used for cleaning the stem.